So after spending all week working on biodiversity restoration – what does one do for the Australia Day long weekend? Make a concerted effort to control feral trout in the beautiful rivers of our region of course… Last year when we trekked the Cotter the water was low, it rained all day and the fish were skittish – this year, they were up for some play. 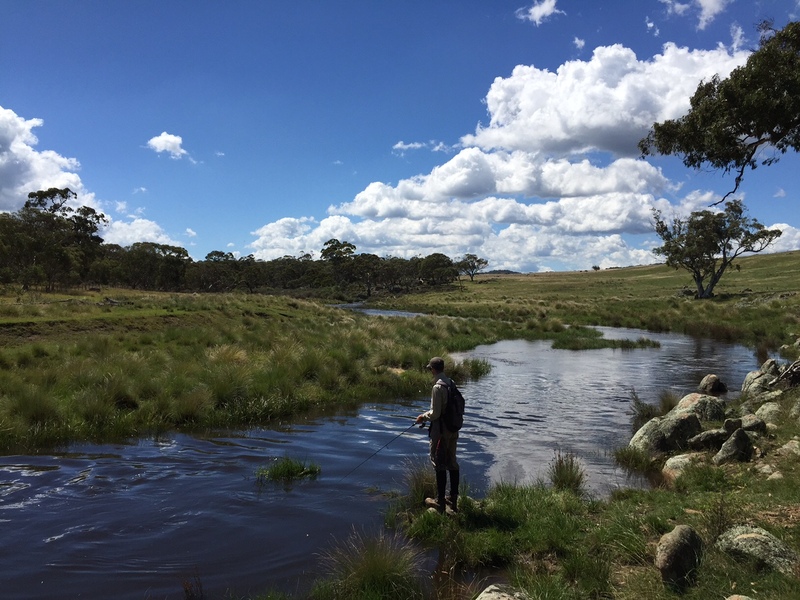 The Cotter catchment is an active water source for the Canberra community, and it is also home to some great walking, fishing and blackberry picking. We hiked into the Cotter well-upstream of Vanity’s Crossing. The plan was to basically ensure we were heading to places where no-one had been, or at least, had not been recently. Our walk-in was energised by endless picking of sumptuous blackberries, we were doing our bit to help control another feral, but I doubt we dented the population dynamics. Wall-to-wall blackberry makes for a great high-energy treat on the trek in and out, and undoubtedly a management headache too. Our first pool on the Cotter looked fishy, and our gun guide from the Flick and Fly Journal had a couple of follows. From there it was boots-wet and walking in and up the river, fishing from pool to pool, avoiding red-bellied black snakes if possible, and enjoying the wilderness. Just as the conservation planners would tell us, the further we were from the car, the less weeds were present, and the more beautiful it was. It is worth the walk – beautiful pool after pool. The hard bit is stopping from going on to ‘check-out the next pool’. There was three of us on the adventure, a good number because one person can stay with anyone seriously injured while the other walks out to get help. But it also means that you need to be careful about who attacks each pool first, with the likely outcome that the first lures would attract the fish, and once one has been caught, their friends are less likely to come out to play. Some beautiful looking pools rightly hosted a bunch of feral fish. Across the 13 km journey we probably connected with a dozen rainbow trout through the day. Actually, we only connected with them during the first half of the day on the way upstream, it seems they were enjoying their own siesta after lunch. Five of the ferals even made the journey back into Canberra with us for their smoking ceremony. Some fish were caught, some were released, and some released themselves. The fish of the day, a 37 cm Rainbow Trout, was smoked. One cool highlight was watching a red belly black snake ‘fishing’. At about 1.5 m long, it was using its stature to force itself underwater and prod and poke its head amongst the rocks – I think chasing tadpoles (of which there were many in the shallow edges of the stream). We only encountered 3 snakes during the day, and they mostly ‘disappeared’ in or into the water. We even had our own ‘by-catch’ with the guru picking up a species of conservation importance – the Two-spined blackfish. Safely released of course. Another good sign were numerous Macquarie Perch, around 10 cm long, sighted on many occasions (> 20) up and down the reach. The high-country was special, but not very productive, this time.